Text ads tailored to their landing page give you best results. This means to align your ad’s messaging to its landing page. It gives users a better experience. It helps you get better value for your ad spend. Use the Pagezii Ad Grader tool to analyze text ads and align your ad messaging with landing pages. 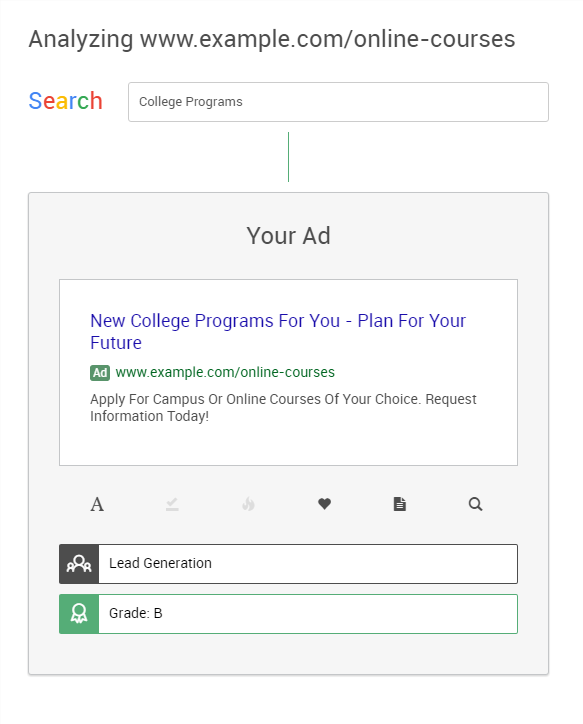 The Ad Grader tool lets you create ads the same way you would on the Google AdWords Platform. The tool counts ad text character limits, so you know exactly what you have to work with. This means you can seamlessly transfer your ads over to AdWords campaigns with zero re-writes. The tool also gives you an ad preview to show the look-n-feel of your ad in a search engine. Use the ad preview to decide if your ads look good from an aesthetic point of view. You can include a few target keywords that would trigger your ads to appear. You won’t find this feature in Google AdWords. Use the keyword targeting feature to see if your ad messaging makes sense for the keywords you’re targeting. Enter the primary keyword you want to target in the Target Keyword field. For our ad example, I’ve entered “college programs” as my focus keyword. The Ad Grader tool also lets you enter synonyms that users might also search for. You can enter a few different synonyms, just make sure to separate them using a comma. Now that you’ve created an ad and honed in on your target keywords, go ahead and start grading. Once you hit the grade button, the tool will give you a detailed breakdown of your ad messaging, targeting and alignment with landing pages. The Ad Grader tool shows your ads style of messaging and gives your ad an overall grade. Your ad also receives an overall grade based on Pagezii’s analysis of your text ads. Dig into more detailed analysis of your ads by hovering over the ad element icons. This shows if Pagezii found important elements in your ad. Connecting ad messaging to a landing page gives users a better experience. This means better results for your ad campaigns. See if your ad and landing page messaging match up using the Ad Grader tool. Ad messaging that matches a landing page will show that they’re connected. Ad messaging that is not aligned with landing pages will show a disconnect. Aligning ad messaging with your landing page gives users the best experience after they’ve clicked. This is good for site visitors, but it’s also good for you. A good user experience means visitors are more likely to take action. Successful text ads include important ad elements. They’re also tailored to the landing page users see after they click your ad. Implementing these best practices means your ads will get more clicks and your visitors will have a better user experience. 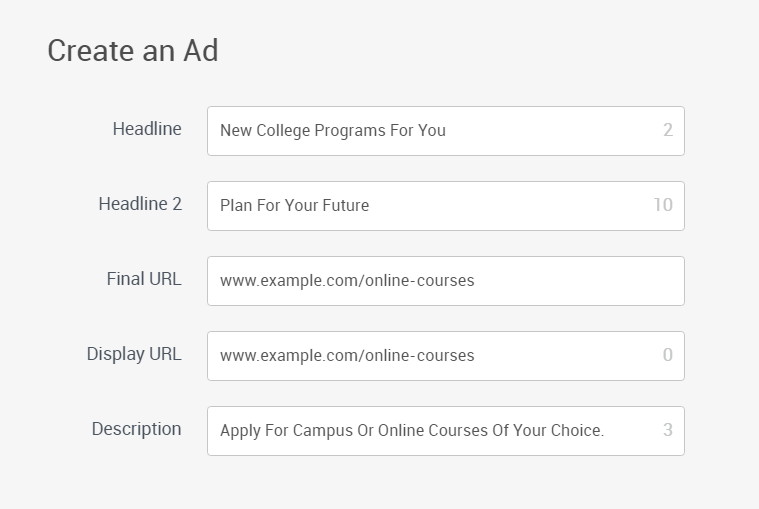 Use the Ad Grader tool to analyze text ads and get the best results from your campaigns.